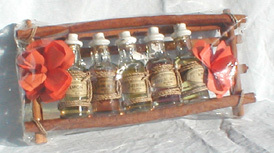 KD041013 Massage Oil Set. Includes: lemon, jasmine, sandal wood, apple, champaka, in wooden rack and 2 red wood flower petals. KD041014 Candle and Incense Set. 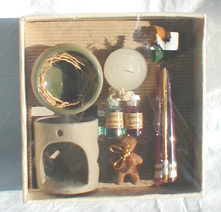 Includes: candle, and candle holder, lavender and lotus oils, and sandalwood and lavender incense sticks. KD041012 Bath Set. 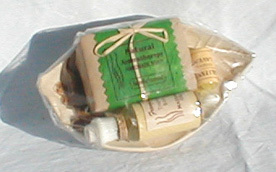 Includes: sandalwood aroma therapy soap, tropical body massage oil, and lavender essence in porcelain leaf shaped holder. 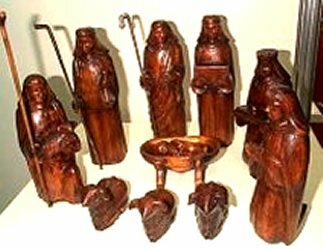 KD051001 11 Piece teak wood carved nativity set, including wooden storage box. The set includes Mary, Joseph, two Wisemen, two Shepherds (6 - 9 inches high), Baby Jesus and cradle and 3 sheep.